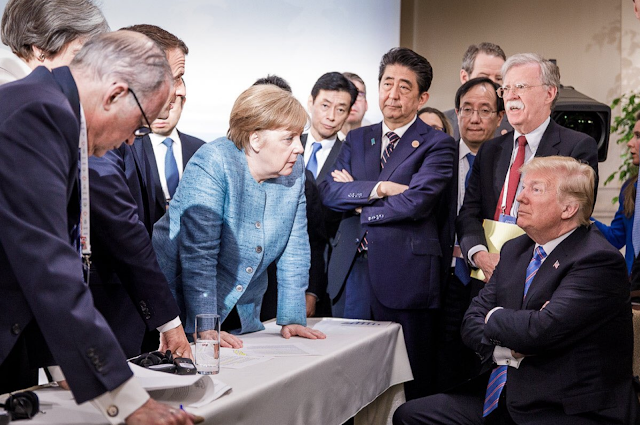 No doubt you've seen it - the photo shown above of the other G7 leaders gathered around Donald Trump on Saturday (taken by Jesco Denzel, a German Government photographer). Most anyone could tell you the basic gist of the some of the emotions which were present in the room, yet it's very much worth our time to break down this moment and evaluate each component. • Although the frame of his glasses obstructs our view of his right eye - his left eyelid is elevated significantly in the presence of a relaxed forehead - which indicating fear. • The manner in which he's holding his legal pad - in front of his groin and lower abdomen - is a form of an amplified fig leaf. This genital guarding indicates he's intimidated by the international environment in which he finds himself - his position as the National Security Advisor - and/or by Emmanuel Macron. The fact that Bolton's speaking as he displays this fig-leaf further supports this conclusion. • This particular cluster of body language was a smart tactic. It projects power, assertiveness, and ownership. 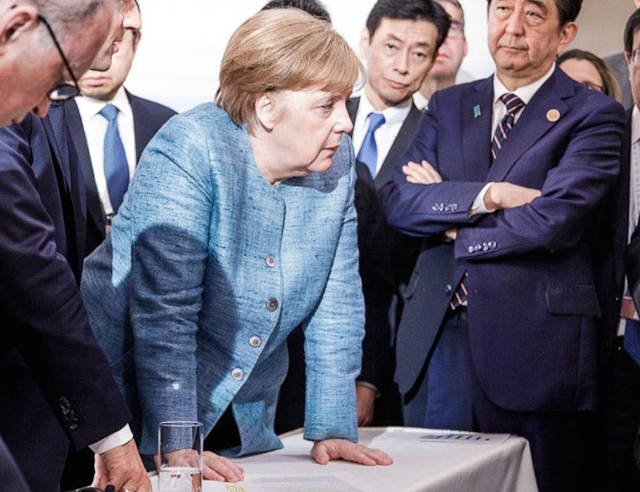 Most professionals fail to use contextual and proportional alpha body language when dealing with alpha men - but not Chancellor Merkel. • Despite the contraction of the forehead noted above, his upper eyelids are passively drooping. 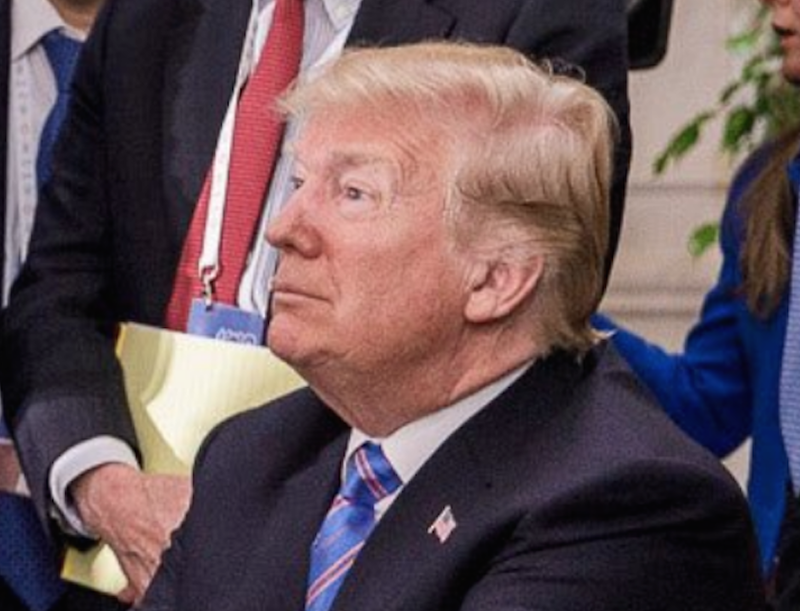 Along with his mid-facial tension - and a trace of a (suppressed) smile - this cluster-combination signals both arrogance and contempt. If you ever find yourself in a similar position as Donald Trump is here, you'd be well-advised to slowly stand up and walk around the table. 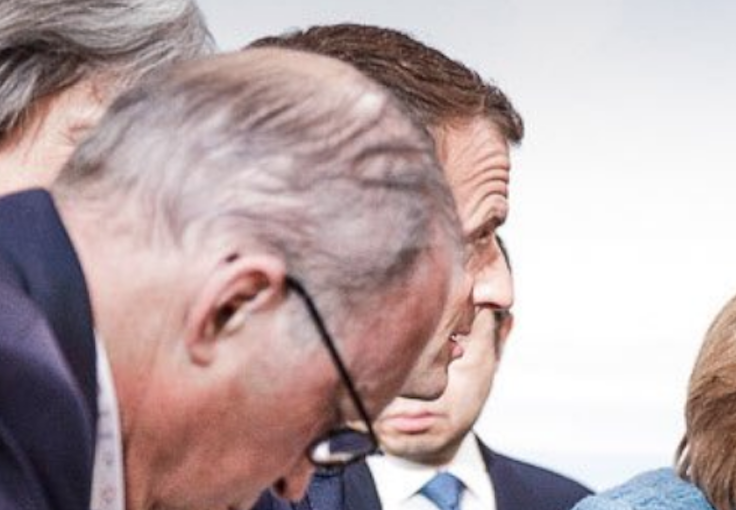 Such a maneuver would increase his confidence and remove physical advantages that both Emmanuel Macron - and particularly Angela Merkel have over him in this scenario. SUMMARY: It's no secret that Donald Trump enjoys being the center of attention. Yet some emotional dissonance is on full display in this photo. 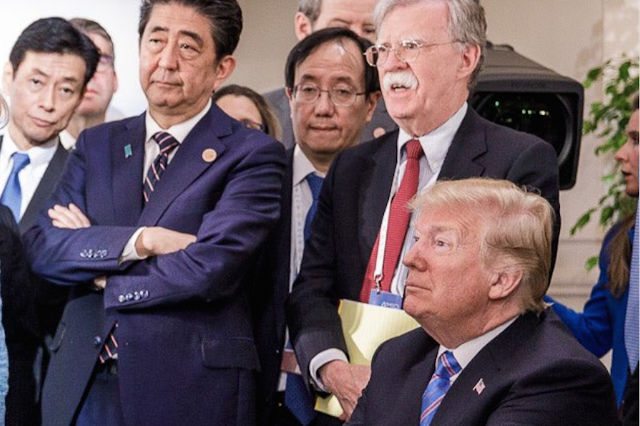 For in his smug moment, the outnumbered American President is also feeling significantly defensive. This example of passive-aggressive behavior is foretelling of his decision to withdraw his support for any U.S. endorsement of the G7 joint communique - one which he had only just agreed to a few hours earlier (shortly after this photo was taken).